During winter break I was digging through some old quilt books, magazines and papers. I found numerous lists for quilts I want to make. You know those lists, right? 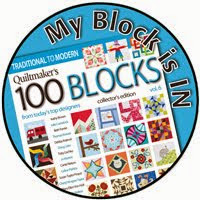 Well over the years, of course, the lists have changed but there were a few quilts that were on every single list. 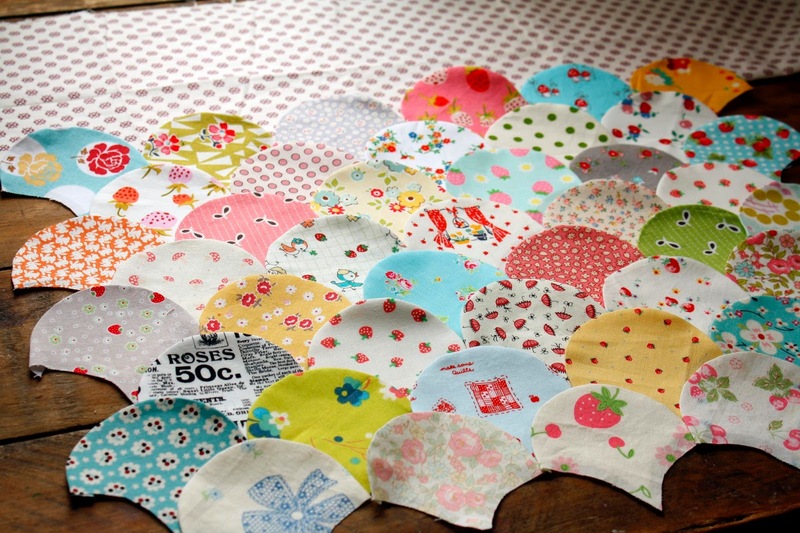 I've decided to concentrate my sewing efforts into making those quilts. This means I can't jump into every quilt along that I want to. Boy, is that hard? 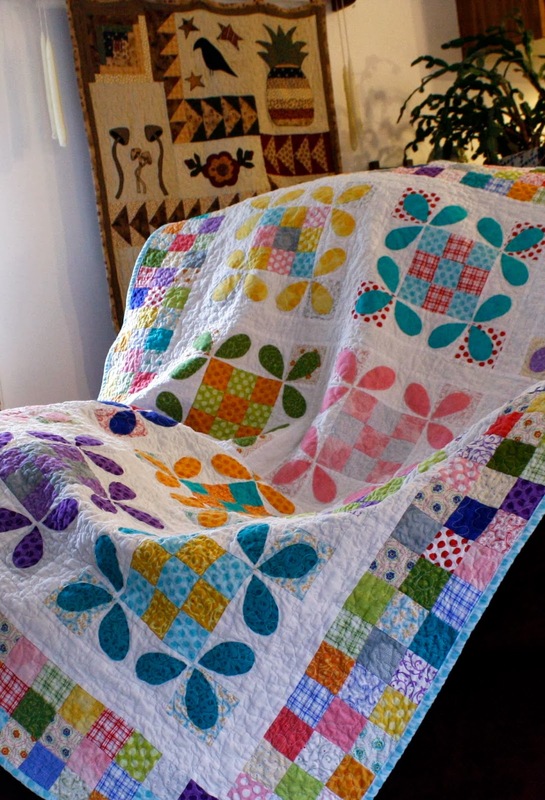 Especially on Instagram, there are some awesome quilt alongs. The first quilt I decided to tackle was the Clamshell quilt. 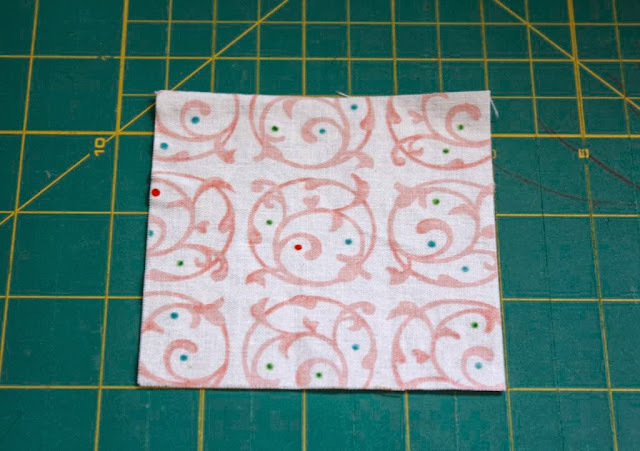 I've wanted to make one since I started quilting. My oldest list is from 2002, so I think it's about time. This quilt will take some time because it will be done by hand. I have no expectations for size, really, I just want to work on it until I'm satisfied. I'm using glue to baste them. It's a first for me. I'll let you know how it goes. So far I like how fast it is. 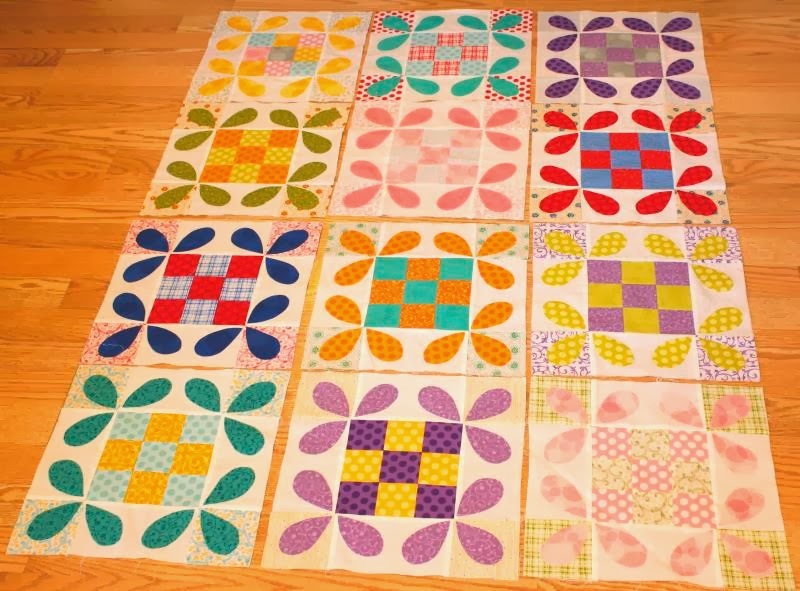 So, do you have any quilts that you want to make but just keep putting it off? What keeps you from making them? 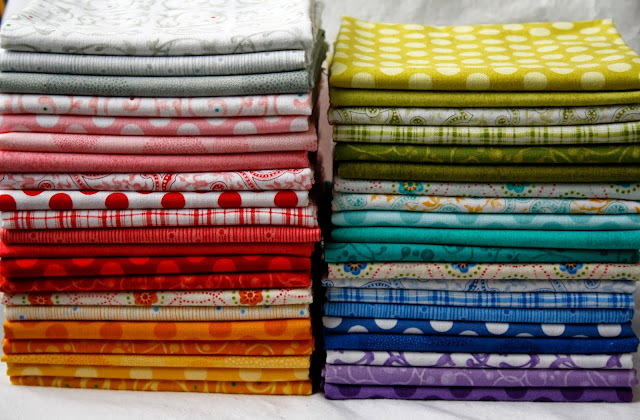 I'd love to hear about the quilts you have on your list! Here are the ones that have been on every single list I make. First of all I'd like to say a big "Thank You" to Heather & Megan for asking me to be apart of all of these great Christmas tutorials. I hope I can deliver. All of the projects have been fantastic! For my Christmas Tutorial I am going to show you how I make, and how you can make, a mini Christmas quilt that can be used for a wall hanging or topple topper. 1 3/4 inch square for the present. Birds, holly leaf, holly berry template here. Draw or trace your pieces onto the paper side of your fusible web. 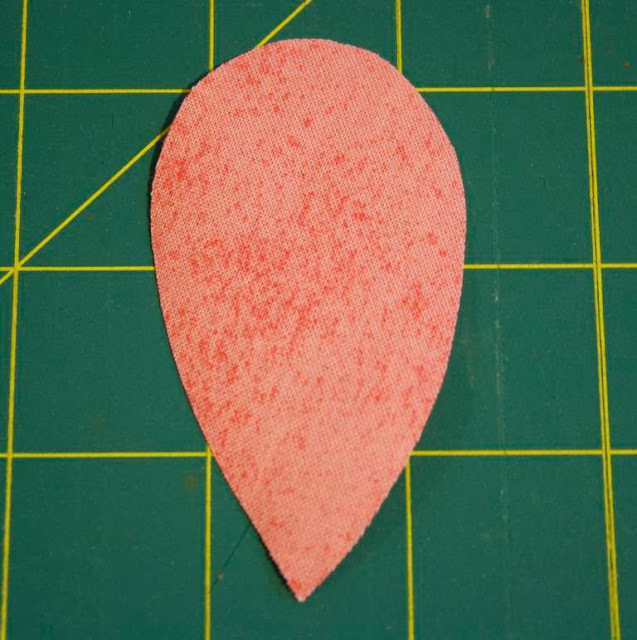 Cut out your pieces leaving at least 1/8 of an inch around your drawn lines. This will insure that the fusible web has covered all of the fabric and there will be less chance of fraying. 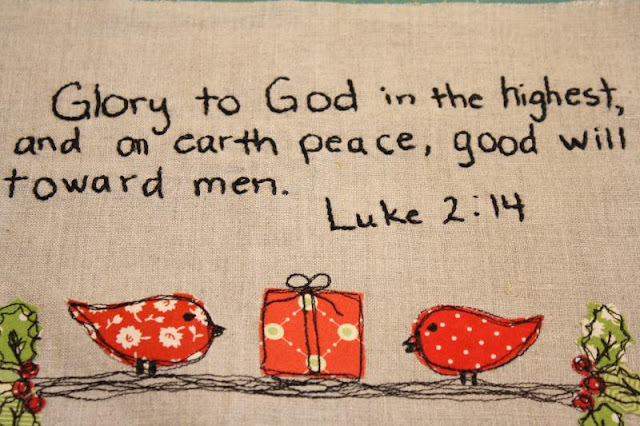 You may use the birds, holly and berries that I drew for you or by all means draw your own. The ones for the file are not what I used here. I tried to draw nicer ones for you to use that are in the file. Birds, holly leaf and holly berry file here. 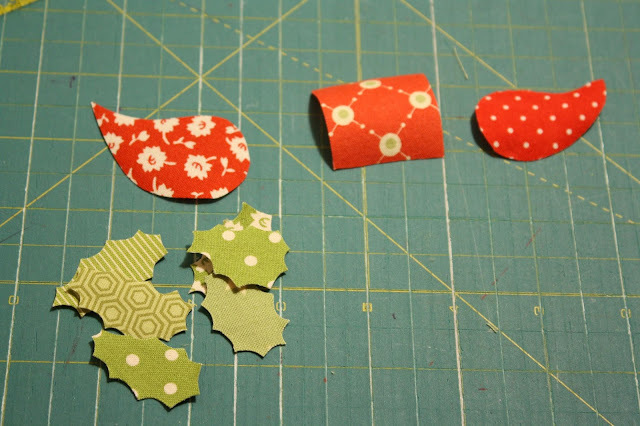 Fuse your pieces to the WRONG side of your fabric. Cut out your pieces ON the drawn line. 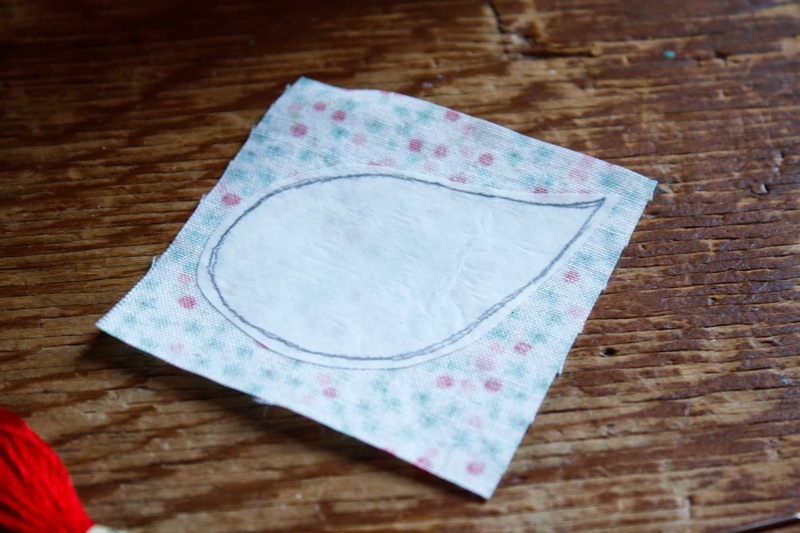 Take the paper off of your pieces and place them like this on your background fabric. When you have them in place iron them down. 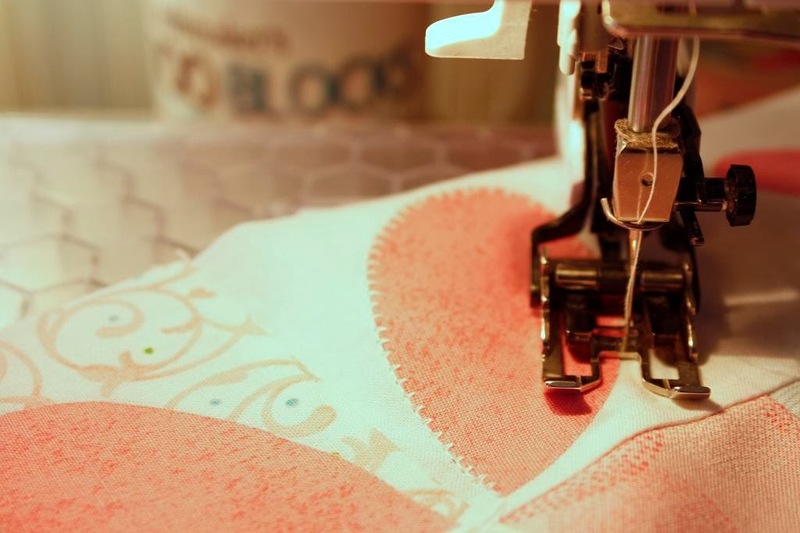 Use black thread and set your machine up for free motion sewing (darning foot, drop feed dogs). I start by outlining the Holly leaves and berries on each side. 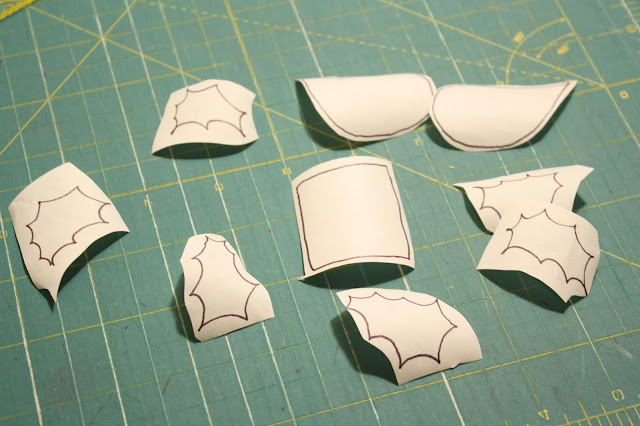 Next I draw a branch between each set of Holly for the birds and present to rest on. Then I outline the present and make little loops for the bow. The birds are outlined next. I like to go around them a few times. 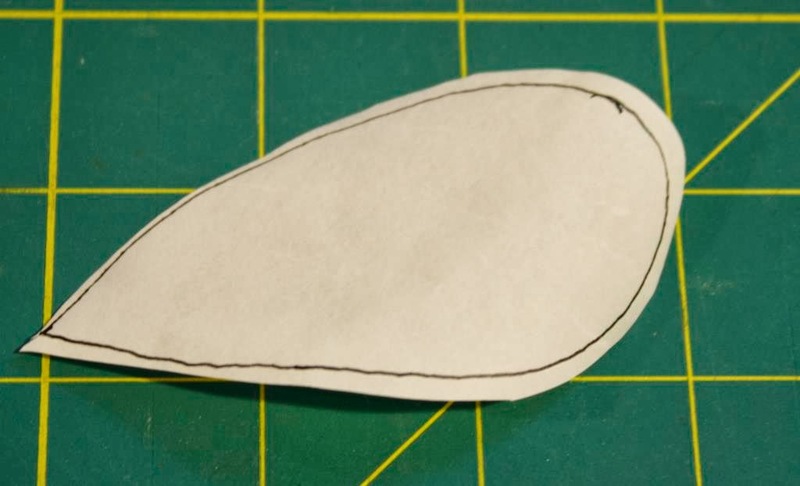 Then make eyes, a beak and little bird legs. 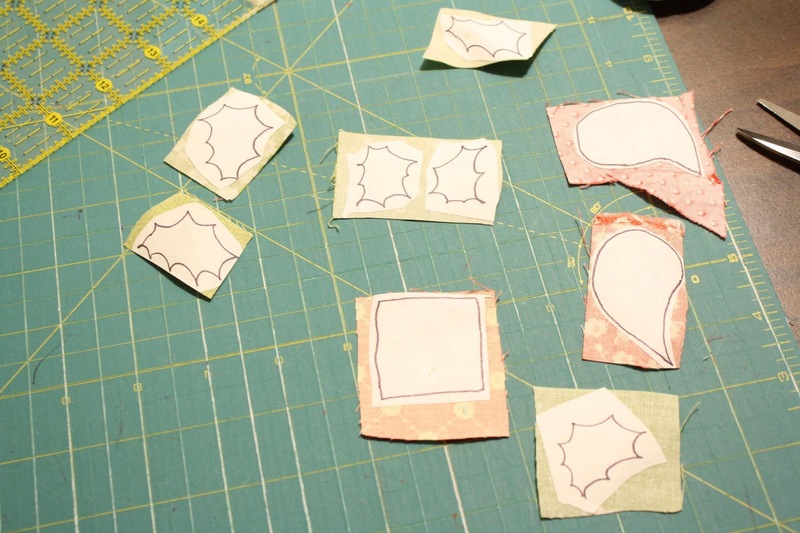 For all of these outlines I like my stitches to fall on the fabric pieces and the background fabric. I like a really drawn / sketchy look. 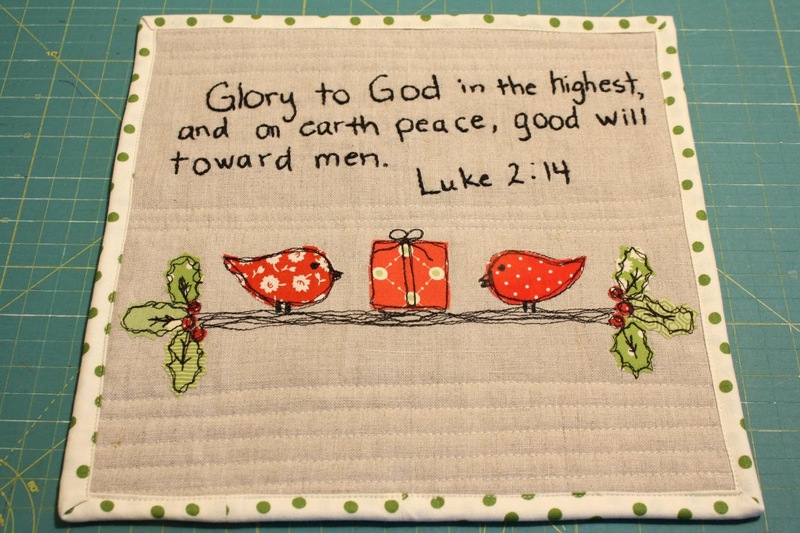 Now this is where you can decide if you are finished with your block or if you want to add some embroidered words. 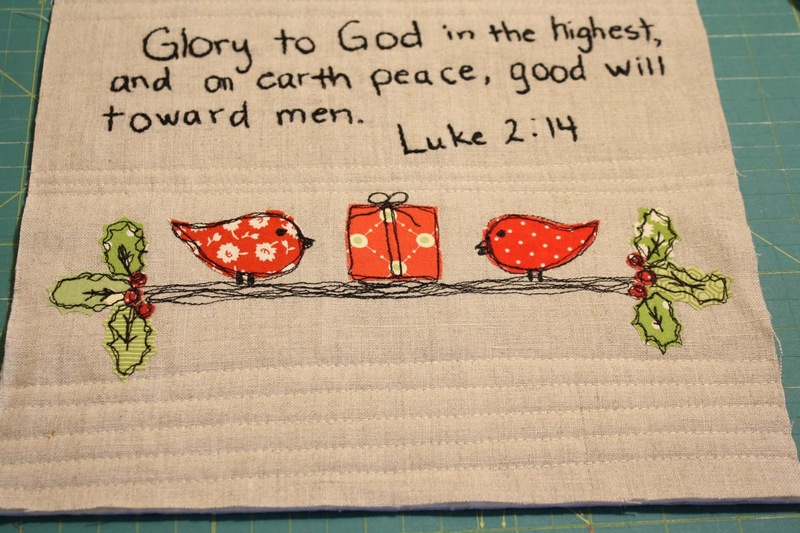 I wanted to embroider a Bible scripture on mine. 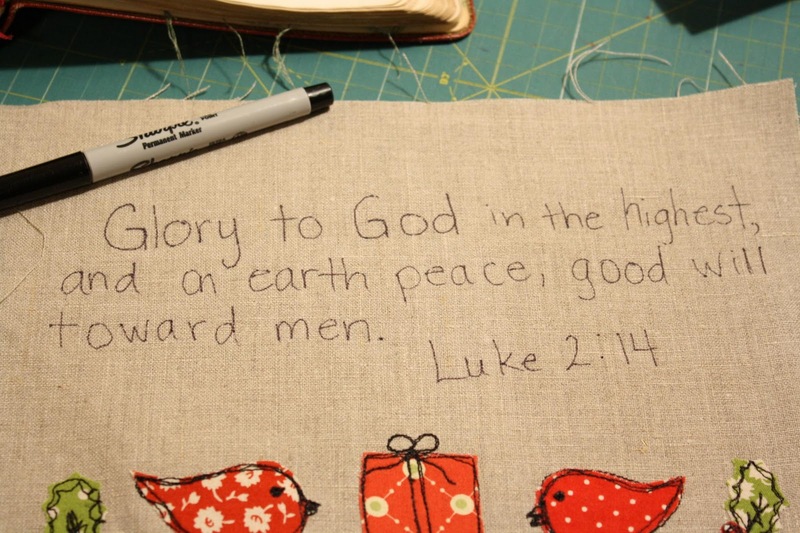 I just grab a Sharpie and write right on the background fabric. Here it is embroidered. I know that it isn't perfect. But it has that handmade feel that my mother loves and this is for her so I know it's okay. You can use a ruler and write very neatly on the lines or use a really pretty font, whatever you like. I prefer this method. Press and square up your block now. There is some shrinkage and distortion from the free-motion stitching and the embroidery. 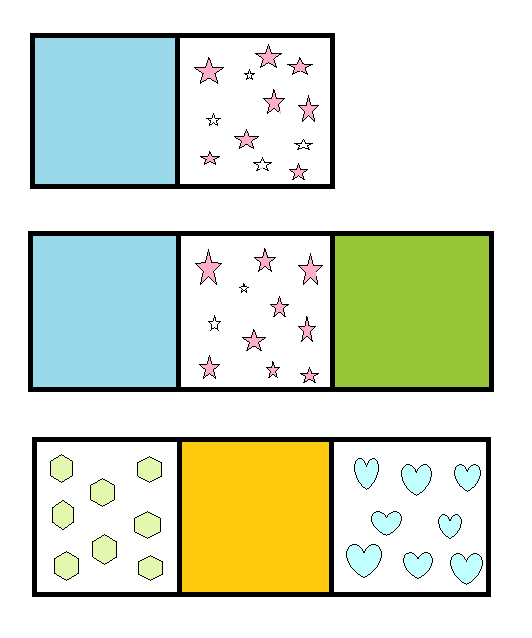 Now you can add a patchwork border or a plain border or leave your block as is. It's really up to you and I have made these using all of the above and they are all great options. 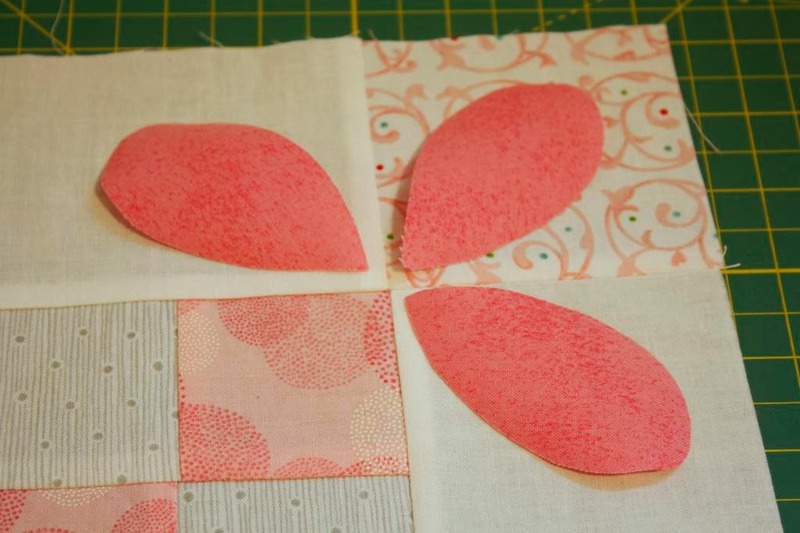 Next layer your block (top), batting and backing fabric to make a quilt sandwich. Baste. 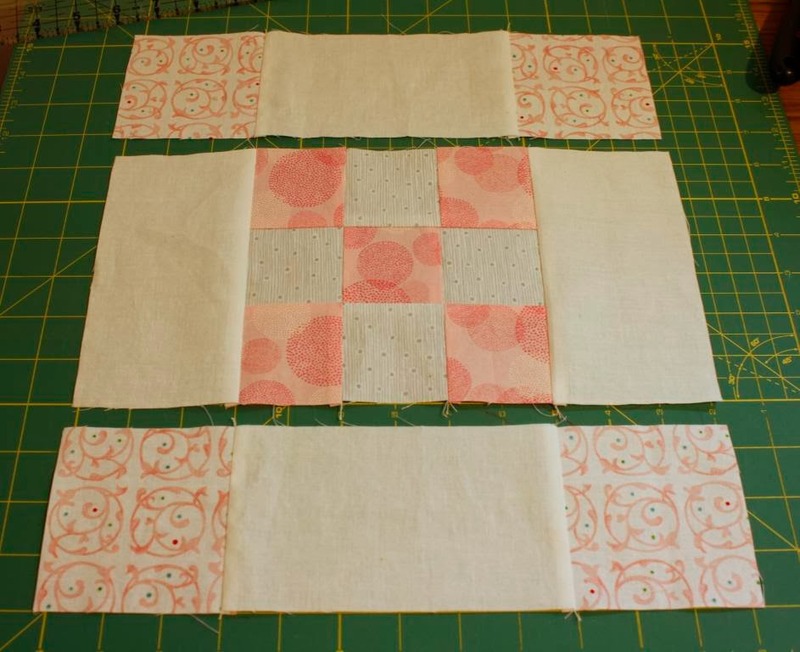 For this quilt I am quilting some horizontal uneven lines with big stitches. 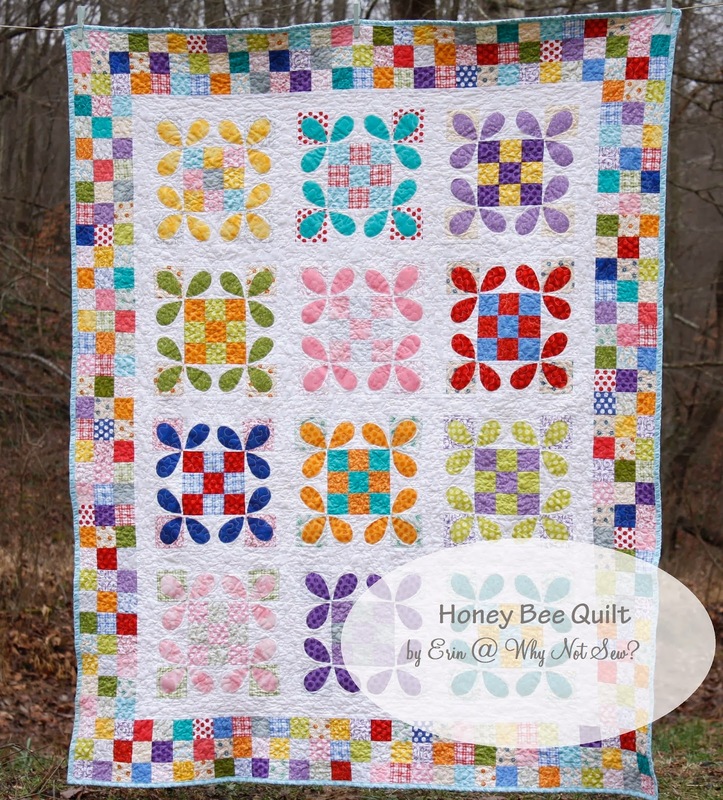 Next thing you do is bind your quilt! I chose a bright cream colored fabric with pretty green polka dots for the binding. That's it! Enjoy your new Christmas quilt! I hope my instructions are clear. If you have any questions please don't hesitate to ask. I hope you all have a wonderful holiday with the people you love! Thanks again Heather & Megan! Hi! My name is Erin. 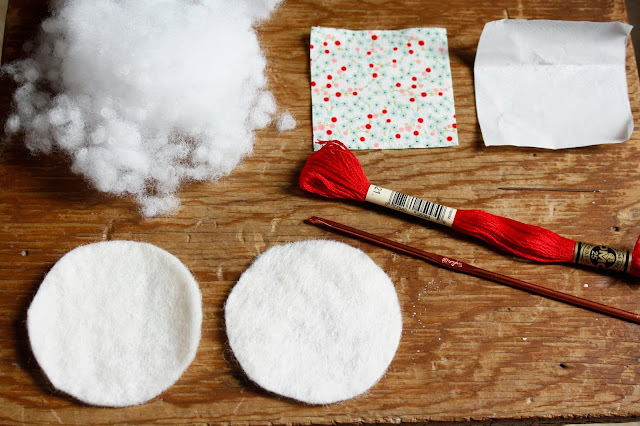 I blog at Why Not Sew? Today I am happy to share with you a tutorial for a lap size Honey Bee quilt with a patchwork border. The blocks sew up quickly and using your machine to applique the bees down saves a ton of time. This would make a lovely gift for someone special. 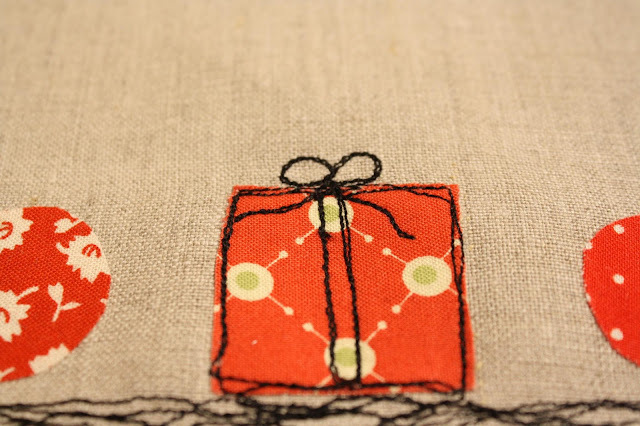 Thanks so much to Benartex for asking me to participate in the Holiday Gift Blog Hop. Let's get started!!! 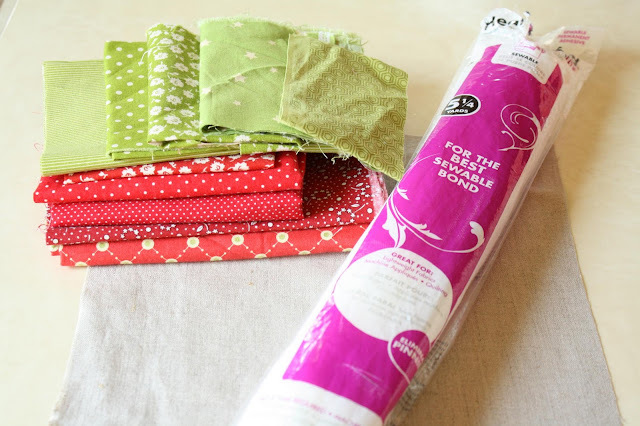 3/4 yard ~ fabric for binding. First make your nine patches. 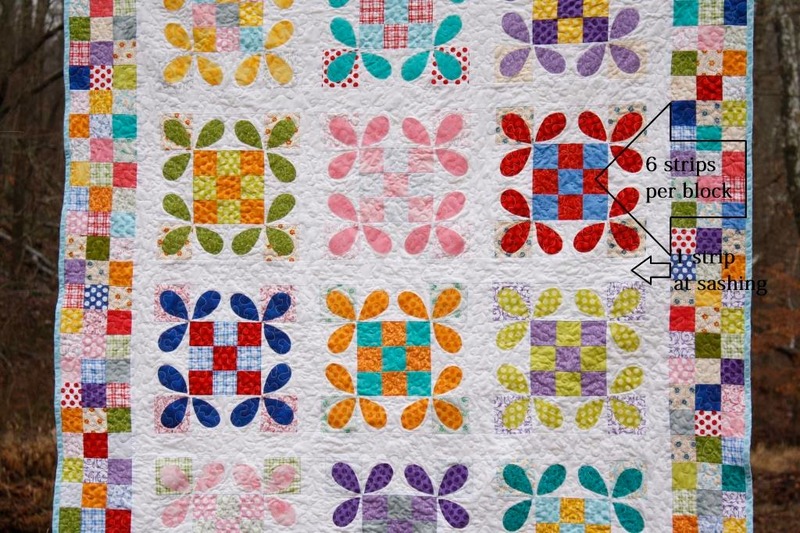 For this quilt you will need 12. Set aside. 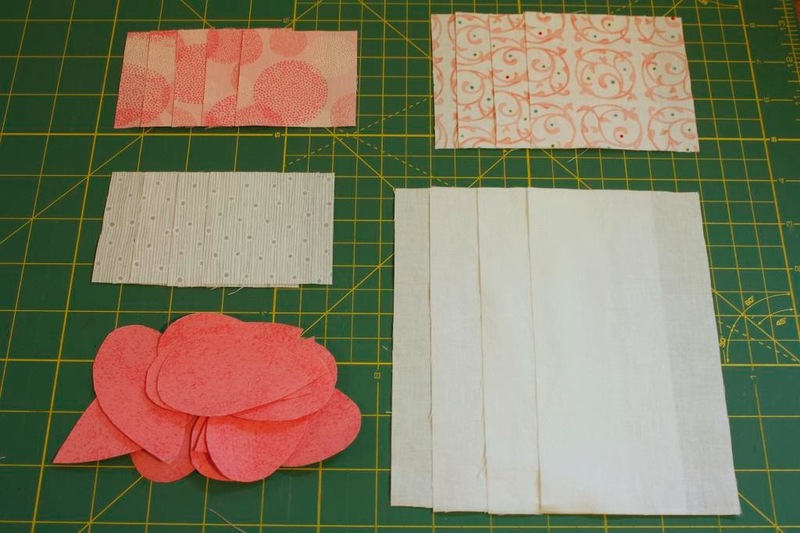 Cut 6.5" X width of fabric. For the fabric I was using I needed 4 strips total to get 48 3.5 x 6.5" rectangles. 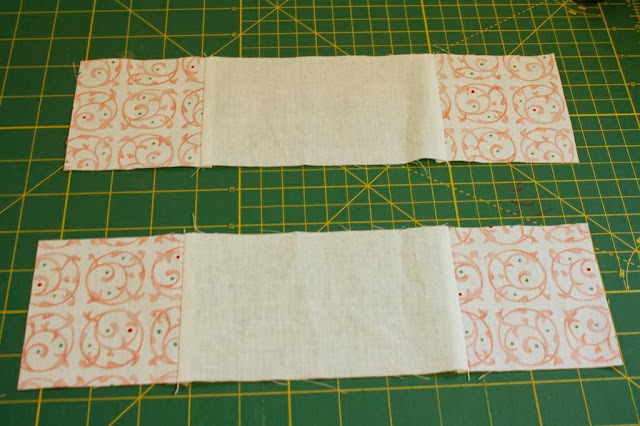 Cut the strips into 3.5 x 6.5" rectangles. 48 total. 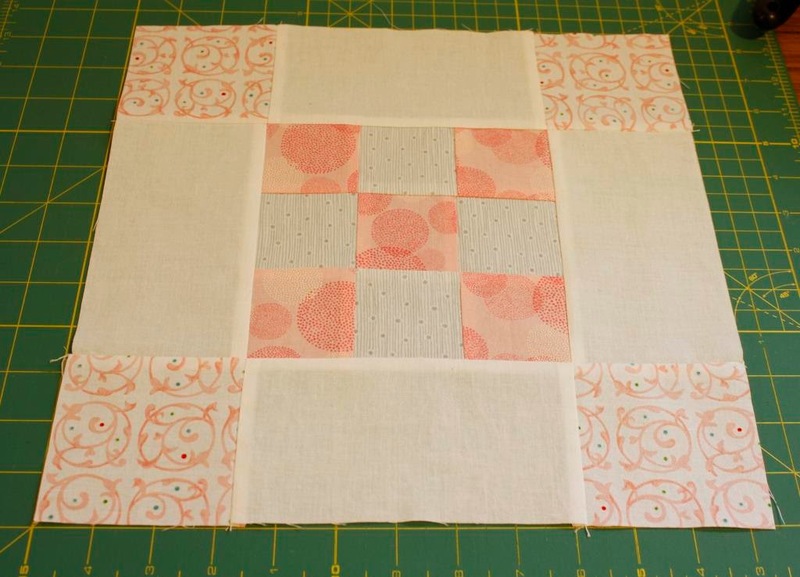 Choose a fabric for the four corners and cut 4 ~ 3.5" squares. 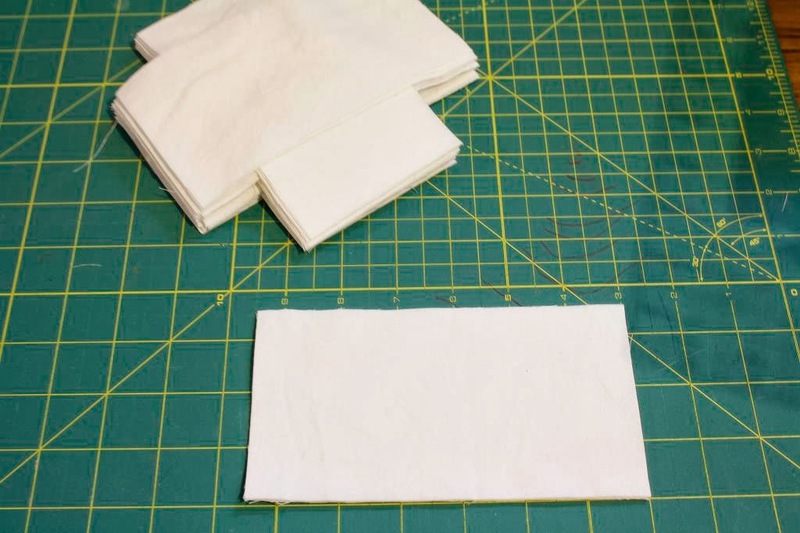 Sew a 3.5" square onto each end of two 3.5 x 6.5" white rectangles. Sew a 3.5 x 6.5" rect. 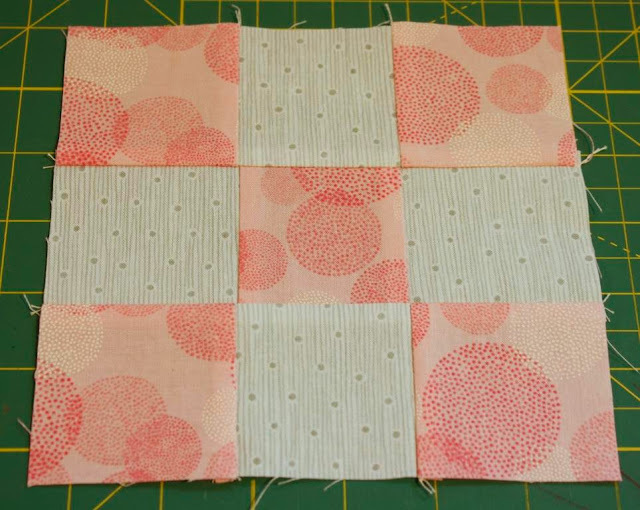 onto the left and right side of the center nine patch block. Press the corner squares in the opposite direction of which ever way you press the rectangles on your nine patch. I chose to press everything towards the white background fabric for these. Now take the template you downloaded. You can download it HERE if you missed it above. Trace the template onto the paper side of the fusible web. 12 times per each block. 144 total. 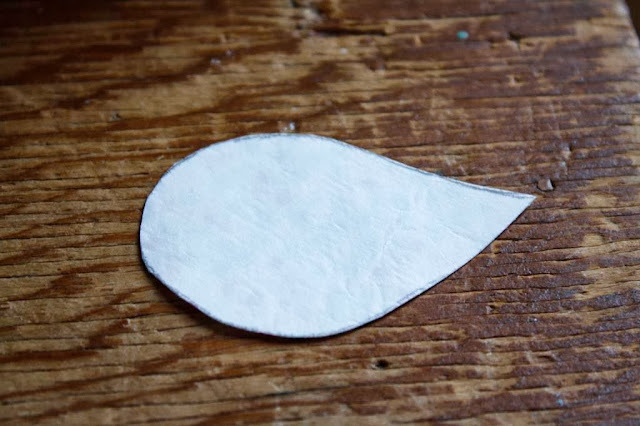 Cut away from paper leaving a small allowance from the drawn line. 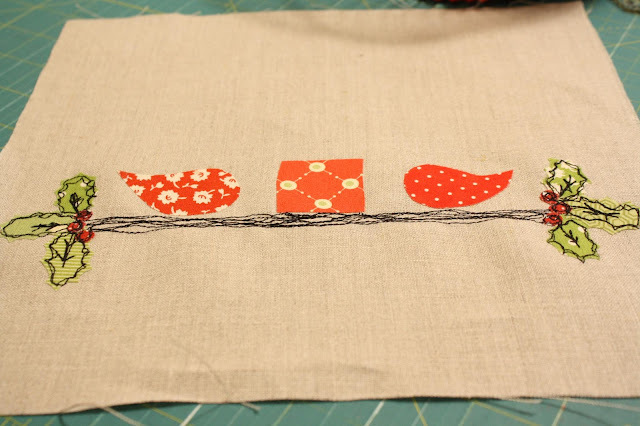 Iron piece onto the WRONG side of the fabric you want for your bee parts. Cut out ON the drawn line. 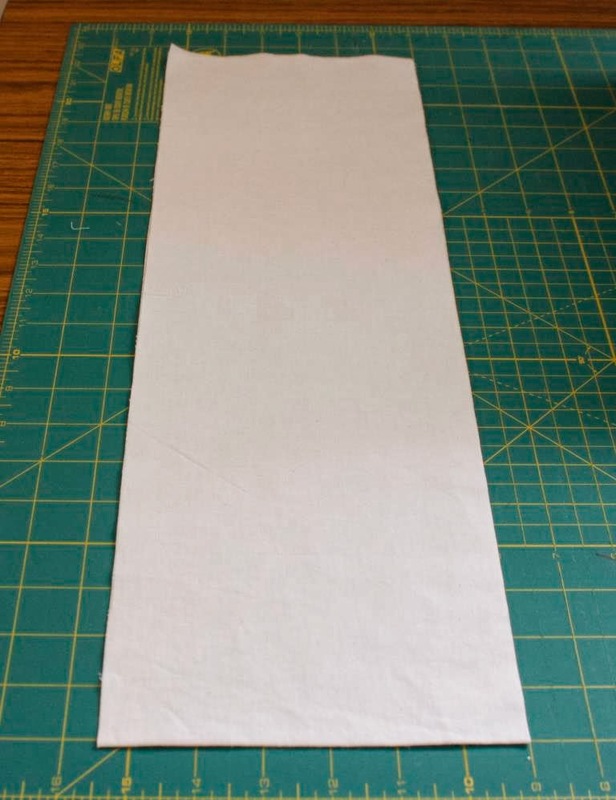 Take the paper off of the back of the piece. Place them on the corner block and the ends of the rectangles. It's easier to place and press one piece at a time so nothing shifts when you lay your iron down. Put 3 bee pieces in each corner. Make sure they are all pressed down and bonded nice and strong. 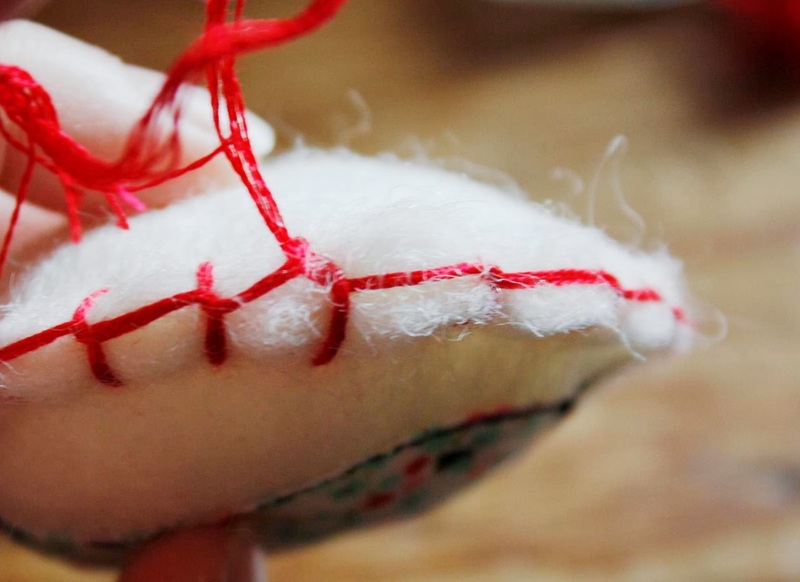 Now machine stitch them down using your preferred stitch. I chose a blanket stitch. 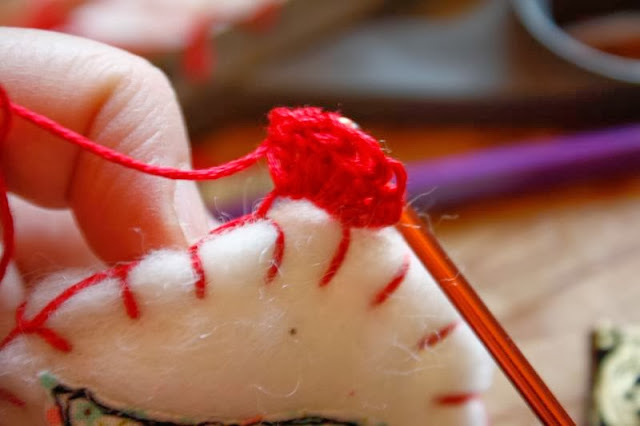 a zig zag stitch would work too. 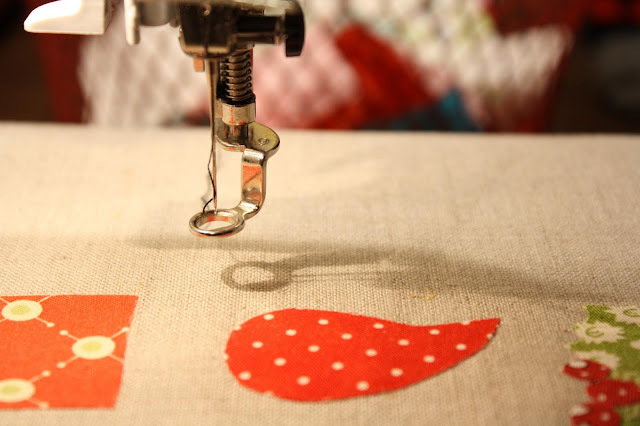 You can straight stitch but eventually you may get some fraying if the blanket is laundered and or used very often. 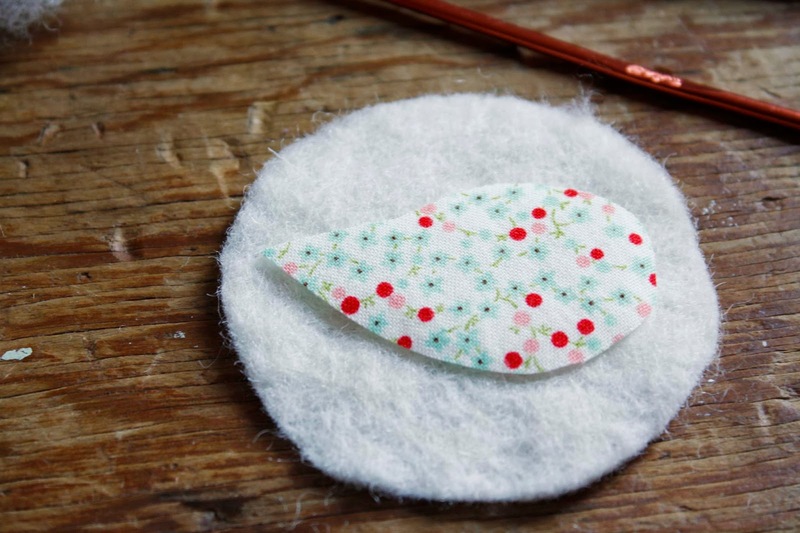 You can also use monofilament if you prefer your stitches to not show. My preferred method and if-you-have-the-time method is appliqueing by hand. I have a "how to" on that here. 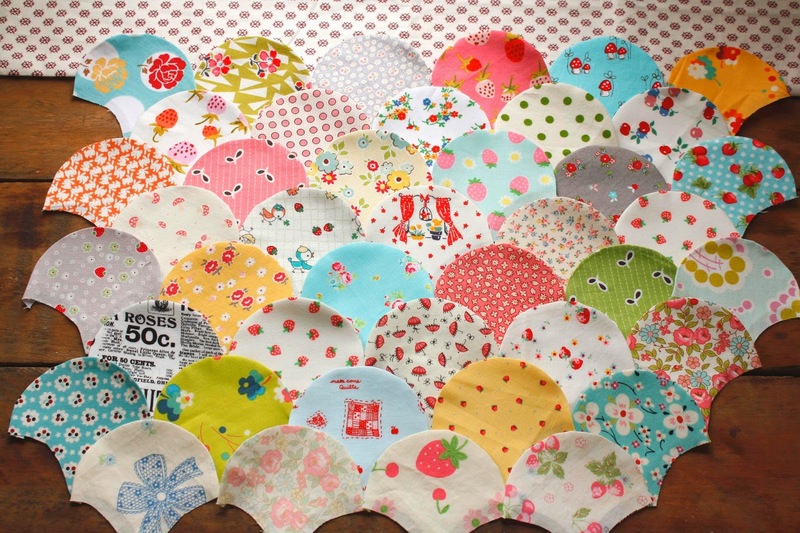 For the border you will need 342 ~ 2.5" squares. Light, medium and dark colors. 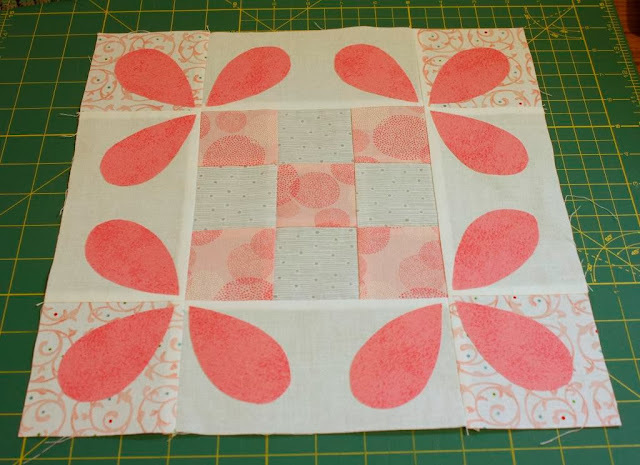 I like to break the border down by piecing enough 3 patch strips to make the top, then the bottom, then the sides. I sew one border at a time to check placement and make sure I don't have too much of one color grouped together. 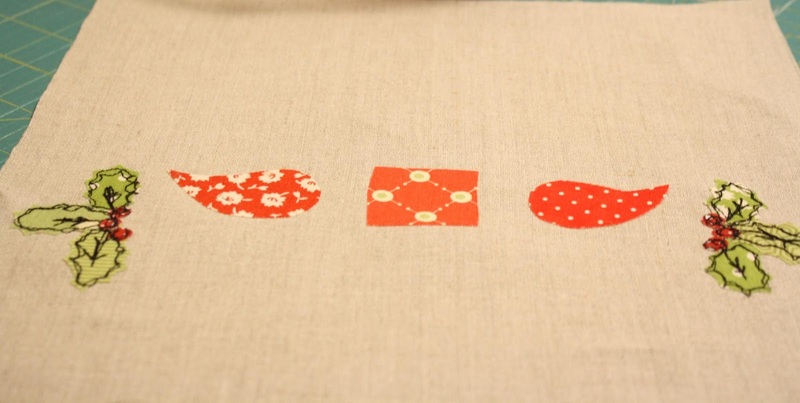 To start I chain piece 22 ~ 2 patch units using light, or white background with print and a medium or dark fabric. Like the top picture in the diagram. Next take 11 of those units and sew a different medium or dark square onto the other end of the light square. Like the second picture in the diagram. Then take the other 11 units and sew a light colored square onto the end of the medium and dark square, Like the last picture in the diagram. 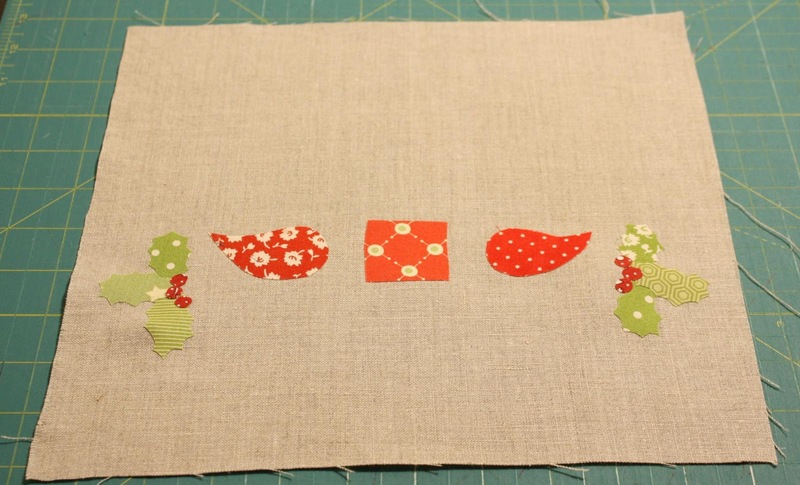 Sew your units together to make the border. Alternating a dark unit and light unit. 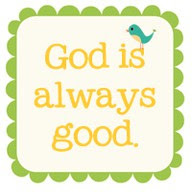 Repeat for the bottom border. *** a note about pressing. I press toward the darker fabric for these units. They should all lock together nicely when sewn. I just wanted to publish this on my blog. 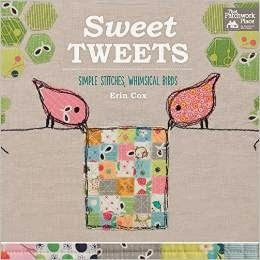 It was originally posted to Quiltstory. Thought I'd add it here too since I've been getting a lot of requests for a crocheted edge how to. Hope you all are well. I'll be back soon!!!! Hi! 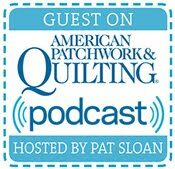 Thank you to Heather and Megan of Quilt Story for inviting me to join the Holiday Tutorial Series! 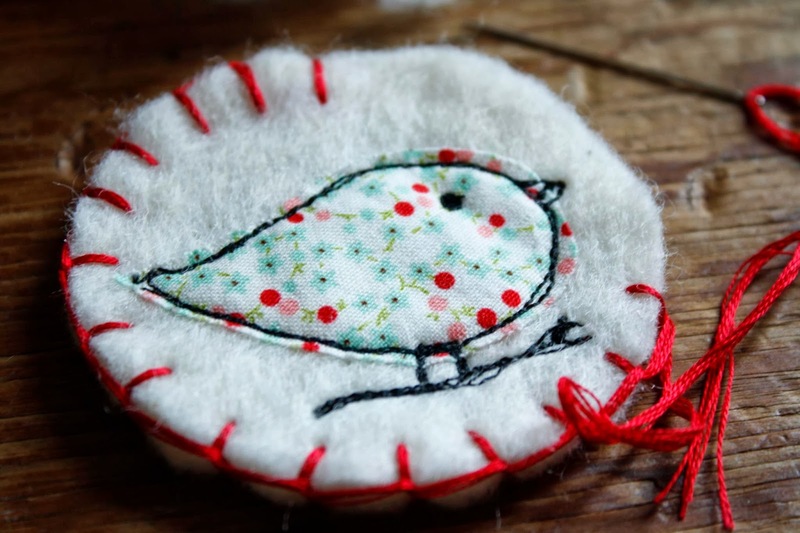 Today I have a tutorial for making a super cute ornament. There is some crochet involved with these cuties and If you do not know how to crochet, no problem! 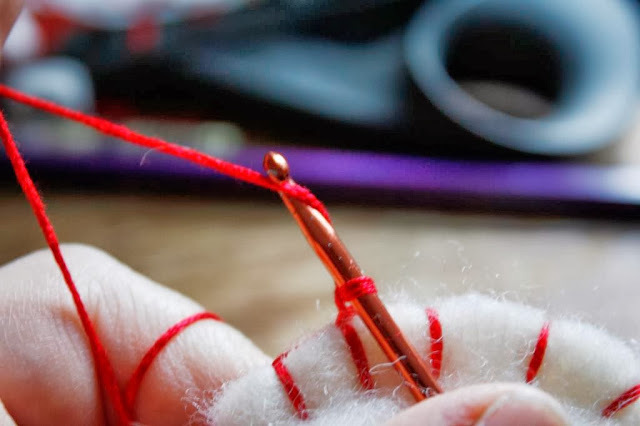 I will give you links to some resources for crocheting. 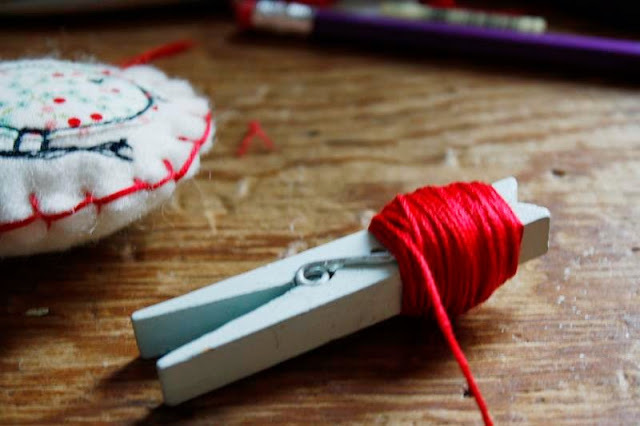 You can just as easily skip the crocheting, if you wish, and they are still just as cute. You could use ribbon, pre-crocheted trim, pom-pom trim etc. in place of the crochet instructions I give to you. Whatever you decide I hope you give them a try. 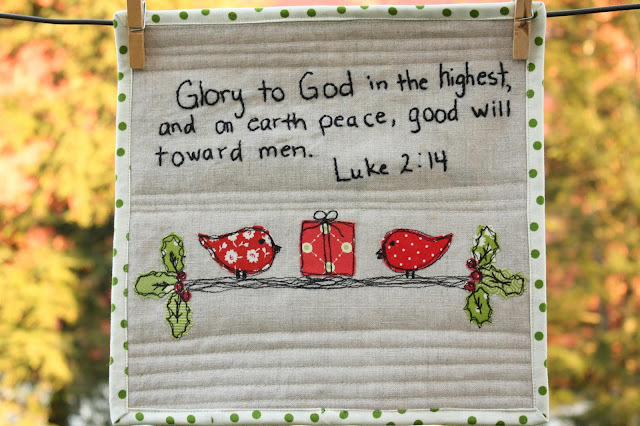 They make great little gifts and a really fun addition to your holiday decorating! Trace the bird template onto the paper side of your fusible web.Cut it out leaving a scant 1/8 of an inch away from the drawn line. 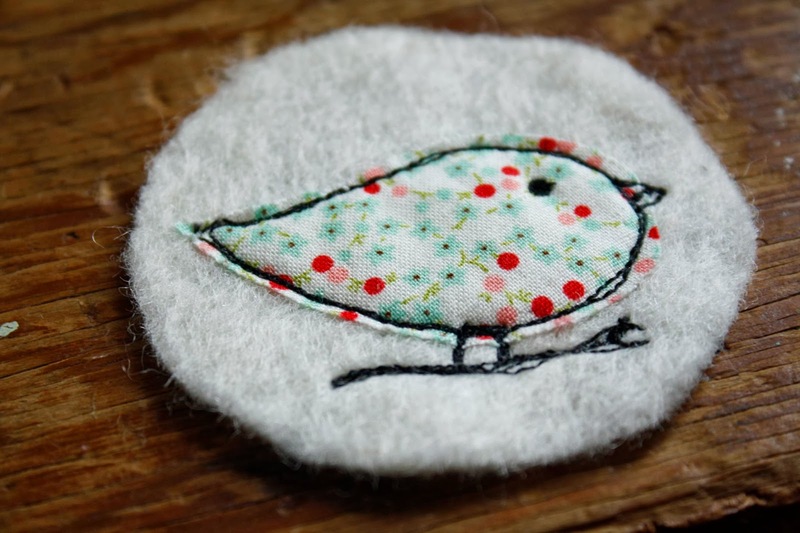 Iron the bird paper side up, fusible side down, onto the WRONG side your piece of fabric. Cut away from the fabric ON the drawn line. Peel the paper off of the back of your fabric. 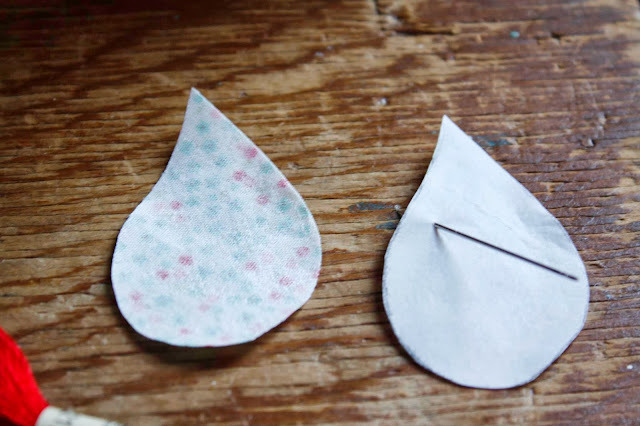 A pin or needle inserted gently through the paper can help with out fraying your fabric. 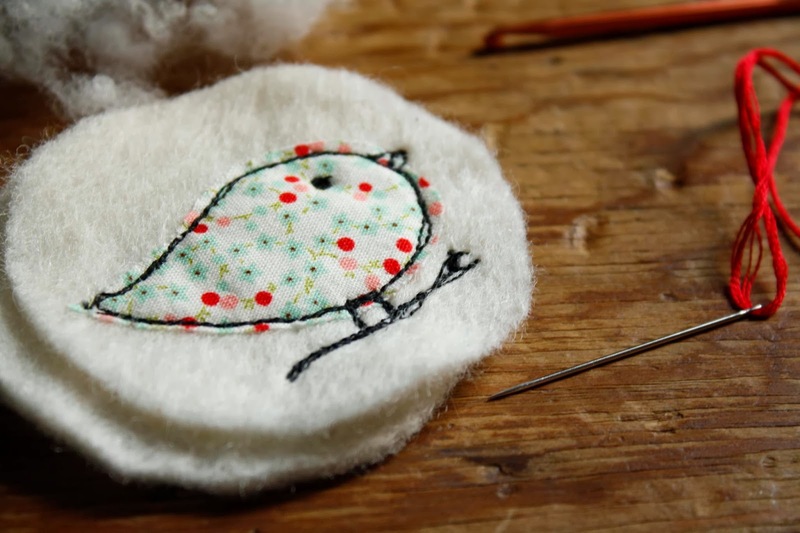 Iron your bird onto one of the wool felt pieces. Applique the bird to the wool felt. I used the thread sketching technique. That's achieved by using your darning or open toe foot and dropping your feed dogs. Use your favorite method. Wind your embroidery floss around a clothespin. 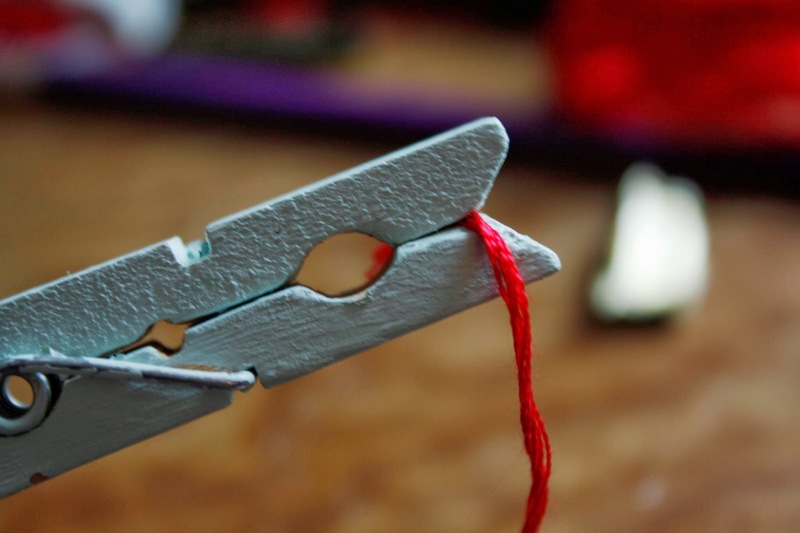 This will save time trying to undo an inevitable knot while you are working! It only takes a second and it's saves so much frustration. 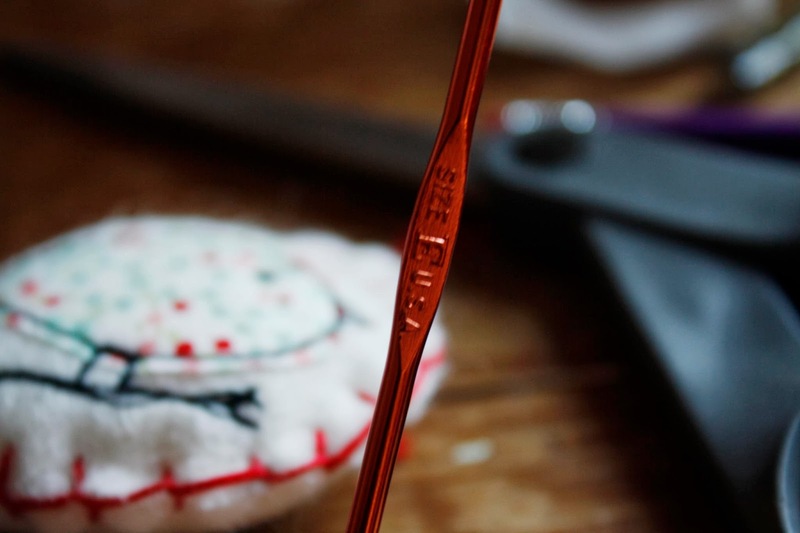 Thread your embroidery needle with all 6 strands of embroidery floss. Just a little less than an arm span long. Knot end. 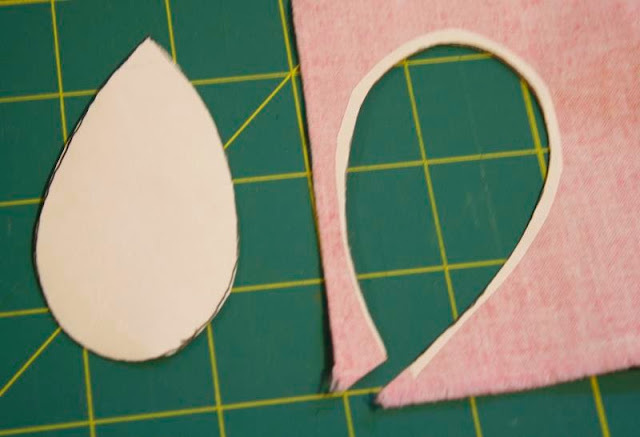 Place your 2 pieces of felt together. Bird side up. 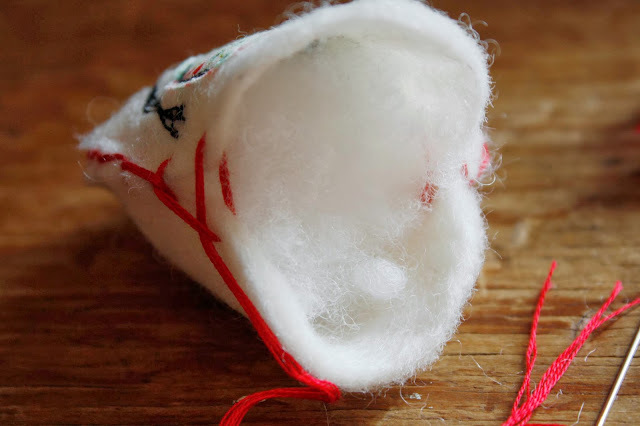 Hide your knot on the inside of the 2 felt pieces. 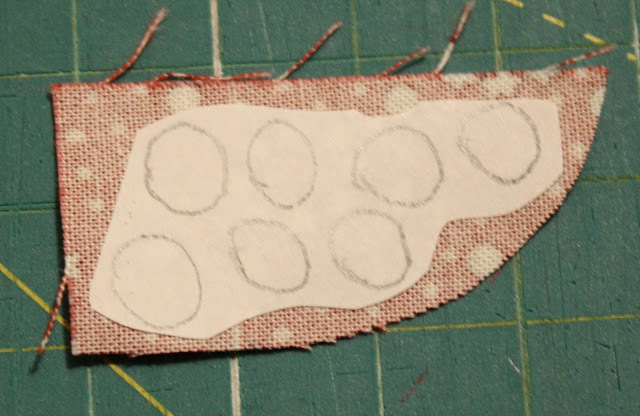 Blanket stitch about 2/3 to 3/4 around the outside of the 2 felt pieces. 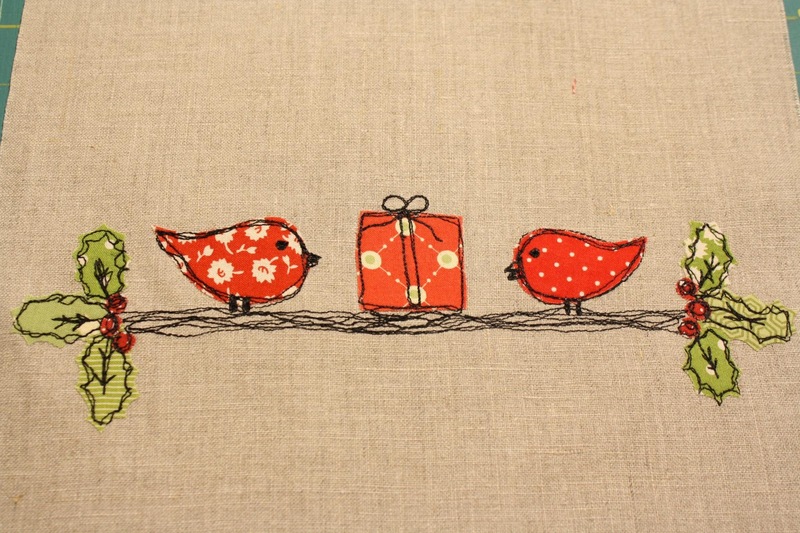 Finish blanket stitching to the end catching your first stitch when making your last stitch. You want an even number of stitches for these ornament. 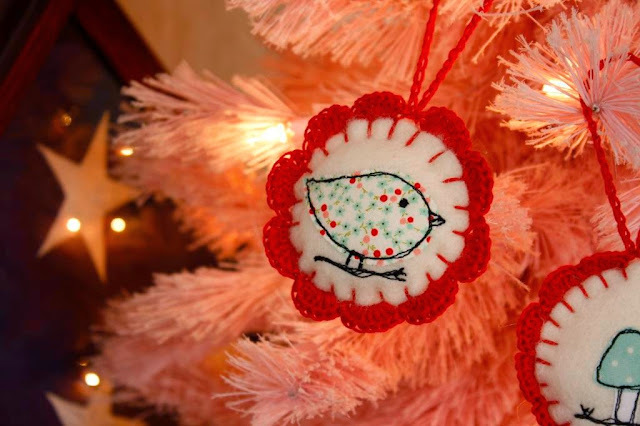 For this one I used 20 stitches but for other ornaments I have used up to 26 stitches. 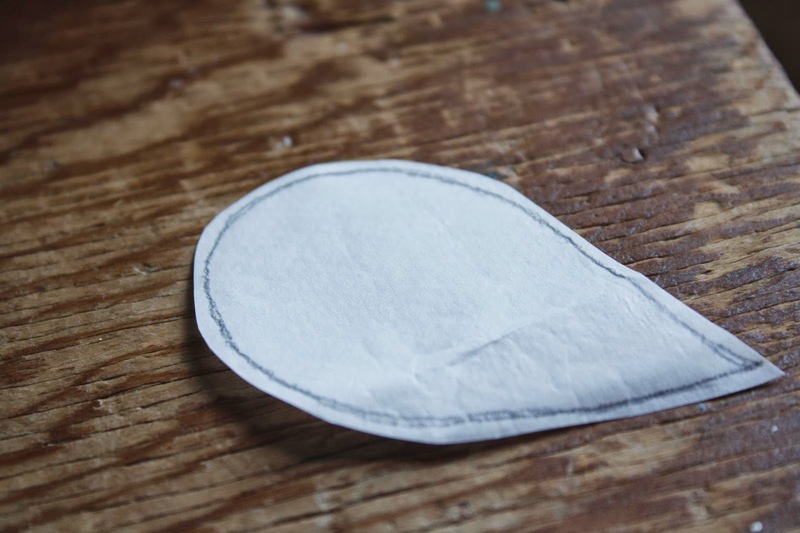 It just depends on how close together you will want your scalloped edge. Now onto the crocheting! Let me preface this by saying I can crochet. I learned to crochet when I was a teenager BUT I am just learning to read patterns and I certainly have not written any patterns before. I've made washcloths, scarves and hats. That's it. So this is going to be very simple explanation. 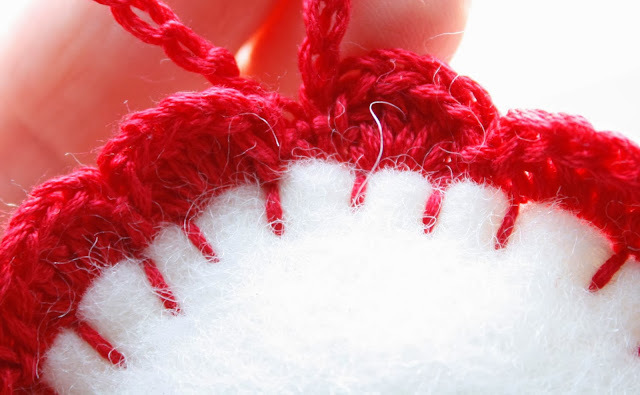 I use chain, slip stitch and double crochet for this ornament. How to's for these 3 stitches are below. Plus there are many crocheting videos on You Tube. 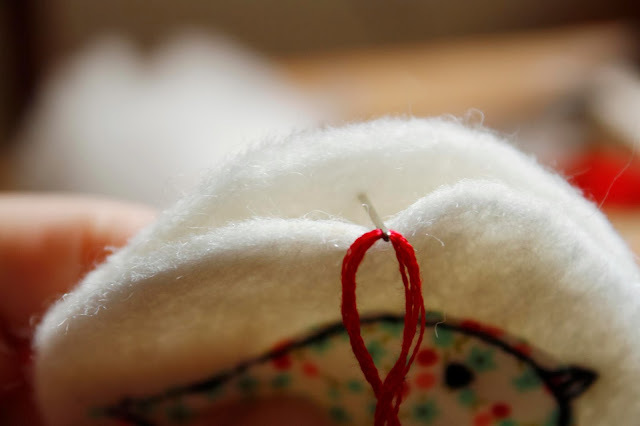 Find the stitch that is at the very top of your ornament. 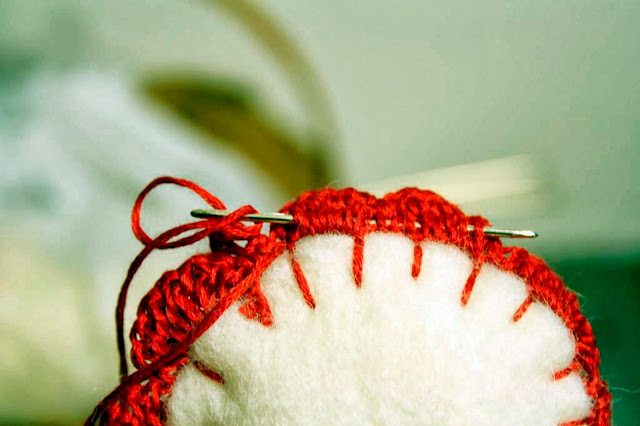 Slip stitch into it. You will have a loop on your hook. Double crochet 7 times into next blanket sitch. *note* If you have more than 20 blanket stitches, say 24 or 26, you can double crochet a lesser amount into the blanket stitches. 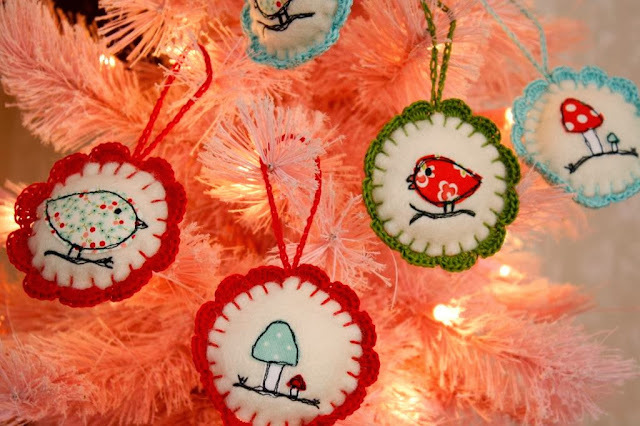 I used 6 double crochets on my ornaments with 24 blanket stitches. They are less squished looking that way. Again, this is all just your preference. This will form your scallop. Sorry about this picture it is not so easy taking pictures while crocheting :) Slip stitch into the next blanket stitch, Double crochet into the next, etc. alternating the two stitches. You should end up with a slip stitch in the very first blanket stitch you started crocheting into. 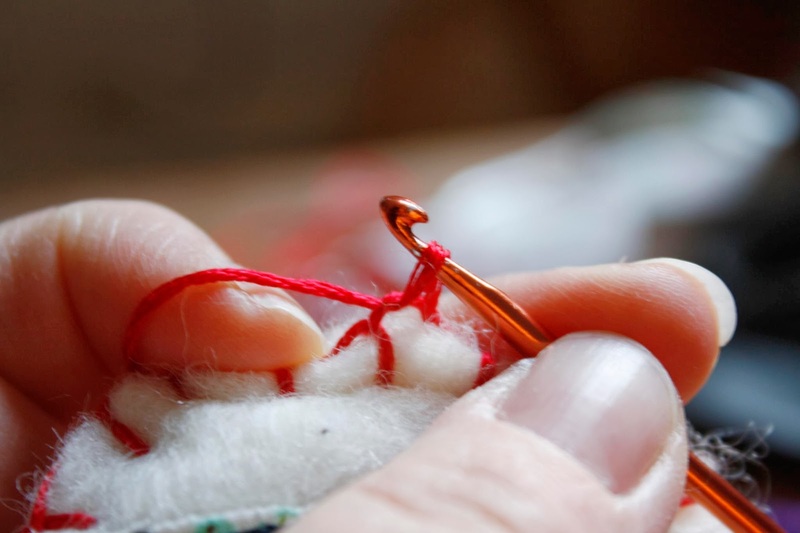 After you slip stitch into the last blanket stitch, chain double the amount of stitches that you would like your hanger to be. I chained 34. You may like yours longer or shorter. 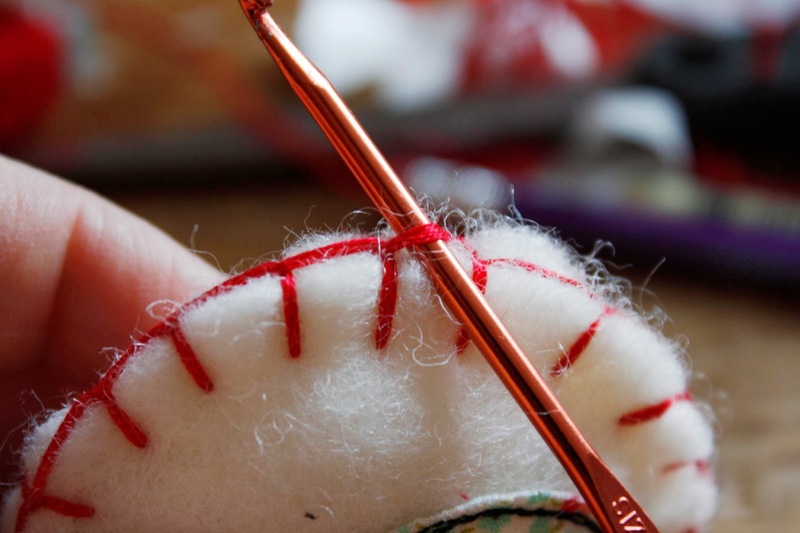 Then slip stitch back into that first blanket stitch where you started and ended crocheting. Cut your embroidery floss leaving a few inches. Pull through your last stitch / loop. Weave your ends into the back of your crochet work (about 2 shells). Cut floss being very careful not to cut your work.